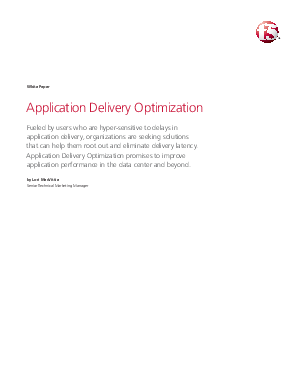 Fueled by users who are hyper-sensitive to delays in application delivery, organizations are striving to root out and eliminate application delivery latency in their environment. In this age of instant-everything, you only have milliseconds to deliver content to your users. That means every component in the delivery chain has merely microseconds to perform appointed tasks, or risk becoming a bottleneck. This paper takes a close look at the causes of bottlenecks throughout the delivery chain, and explores an integrated approach that eliminates inefficiencies to boost performance and security.